Figure 1. 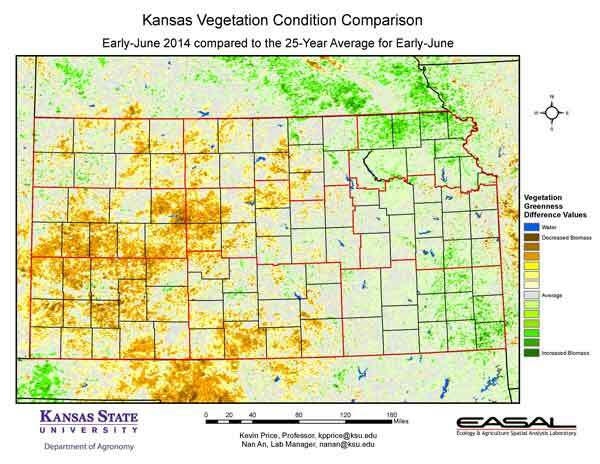 The Vegetation Condition Report for Kansas for June 3 – 16 from K-State’s Ecology and Agriculture Spatial Analysis Laboratory shows that vegetative activity is highest in the eastern third of the state. High photosynthetic activity is also evident in Ellsworth and McPherson counties in central Kansas. Figure 2. 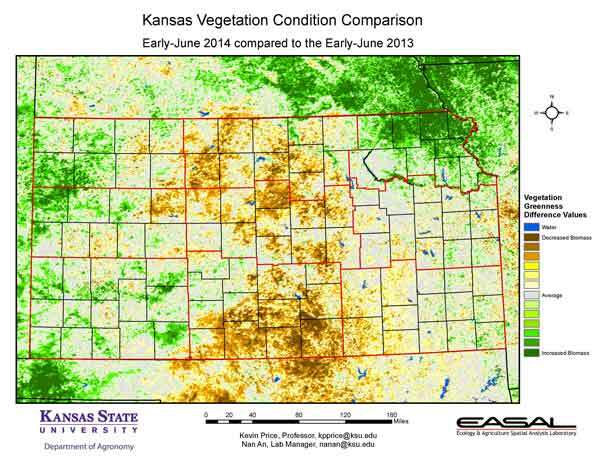 Compared to the previous year at this time for Kansas, the current Vegetation Condition Report for June 3 – 16 from K-State’s Ecology and Agriculture Spatial Analysis Laboratory shows that the biggest decrease in plant production is across the center of the state. In particular, Harper and Sumner counties in south central Kansas have much lower levels of photosynthetic activity. In contrast, Sherman and Wallace counties in western Kansas and Nemaha, Brown, and Doniphan counties in northeast Kansas have much higher levels of photosynthetic activity. In the northeast, favorable weather conditions have accelerated growth. In the west, extremely poor conditions last year mean that even slight improvements this year are noticeable. Figure 3. 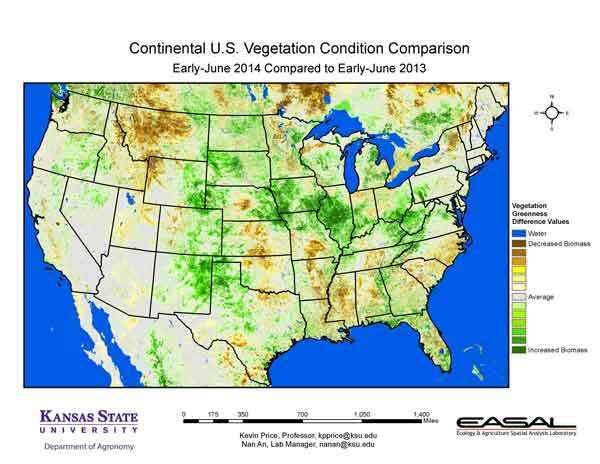 Compared to the 25-year average at this time for Kansas, this year’s Vegetation Condition Report for June 3 – 16 from K-State’s Ecology and Agriculture Spatial Analysis Laboratory shows lower-than-average production in the southwest, through Trego and Ellis counties in the West Central and Central Divisions. Continued drought is the major culprit, although flooding was an issue in parts of central Kansas due to heavy rains during the period. Figure 4. 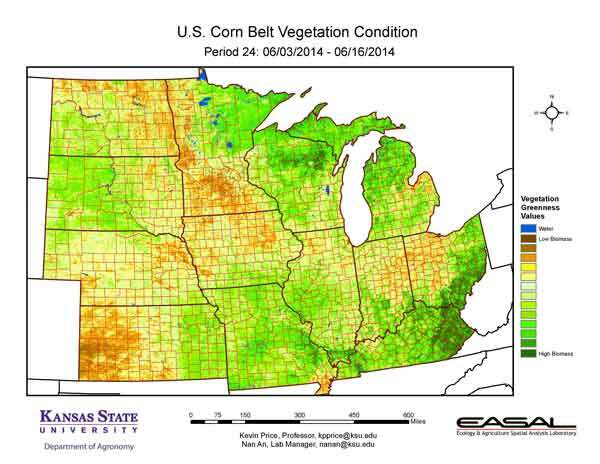 The Vegetation Condition Report for the Corn Belt for June 3 – 16 from K-State’s Ecology and Agriculture Spatial Analysis Laboratory shows that high NDVI values are most concentrated in the eastern portions of the region, as well in northern Wisconsin and the Upper Peninsula of Michigan. Balanced moisture has favored plant development in these areas. For Kentucky, crops and pastures are generally 70 percent good to excellent; while the amount reported in poor condition is in single digits. There is a significant area of low photosynthetic activity from North Dakota through Iowa and northeastern Nebraska. Excessive rainfall is a problem in these areas. 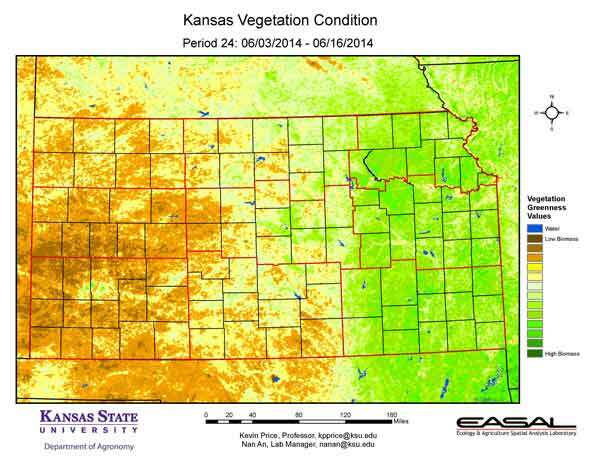 Extreme to severe drought continues to hamper plant development in western Kansas. Figure 5. 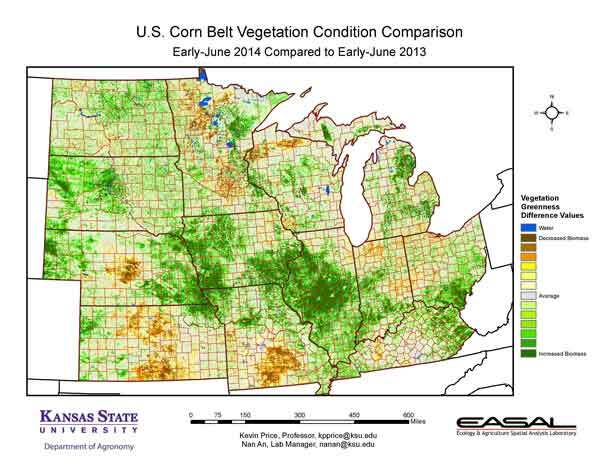 The comparison to last year in the Corn Belt for the period June 3 – 16 from K-State’s Ecology and Agriculture Spatial Analysis Laboratory shows that much of the region has higher levels of plant production than last year at this time. Most noticeable is the activity in western and central Illinois. This year, planting and emergence were closer to the average than last year. Figure 6. 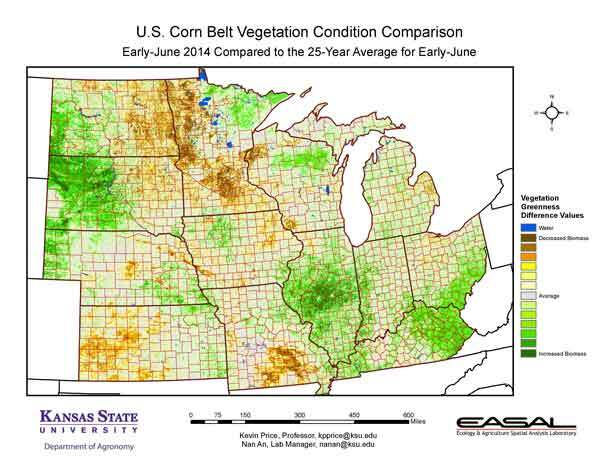 Compared to the 25-year average at this time for the Corn Belt, this year’s Vegetation Condition Report for June 3 – 16 from K-State’s Ecology and Agriculture Spatial Analysis Laboratory shows that western South Dakota and central Illinois have above-average biomass production. Western South Dakota has had favorable temperatures and moisture, avoiding the excessive rains of eastern South Dakota. Similarly, central Illinois has had generally favorable weather conditions. Soil moisture in the Central Division of Illinois is 80 percent adequate and only 6 percent surplus. In contrast, southeastern Illinois reports soil moisture at 48 percent surplus. Figure 7. The Vegetation Condition Report for the U.S. for June 3 – 16 from K-State’s Ecology and Agriculture Spatial Analysis Laboratory shows that highest biomass production is centered around West Virginia, and continues along New England. Soil moisture in West Virginia is reported at 86 percent adequate. Figure 8. 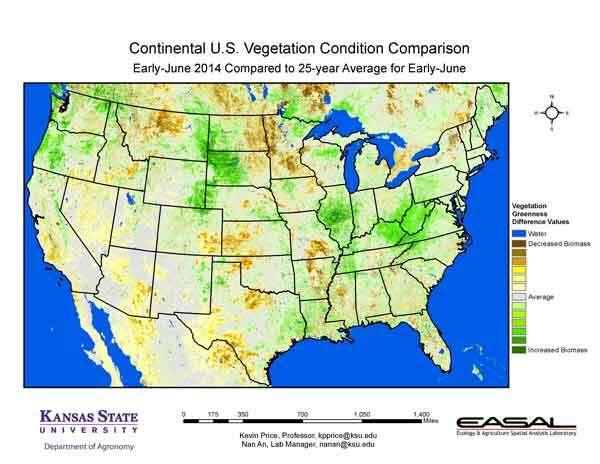 The U.S. comparison to last year at this time for the period June 3 – 16 from K-State’s Ecology and Agriculture Spatial Analysis Laboratory shows that increased biomass production is prominent in the parts of the Central U.S. from Illinois to eastern New Mexico. In the West, while the increased productivity is welcome, it is primarily a reflection of the extremely poor conditions that prevailed last year. Figure 9. 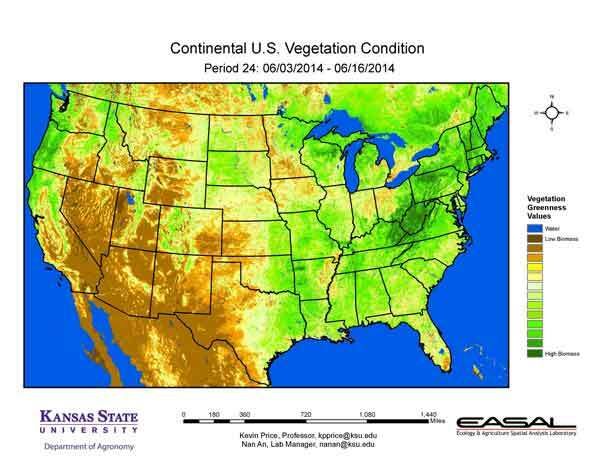 The U.S. comparison to the 25-year average for the period June 3 – 16 from K-State’s Ecology and Agriculture Spatial Analysis Laboratory shows that the biggest region of above-average photosynthetic activity is in the western part of the Northern Plains and in the Ohio River Valley. Along the upper Missouri Basin, excessive rains have limited field work and plant development. The NWS Forecast Office in Sioux Falls, South Dakota has reported 14.69 inches so far in June, which puts it on track for the wettest June on record.